End Of The Line For The EUR/USD – Cable Rallies? Good evening folks, good to have you back! I came across a very interesting chart today, and I think it is worth contemplating for a moment. It is from Yardeni research, their research and charting is a treasure trove, you should check it out. 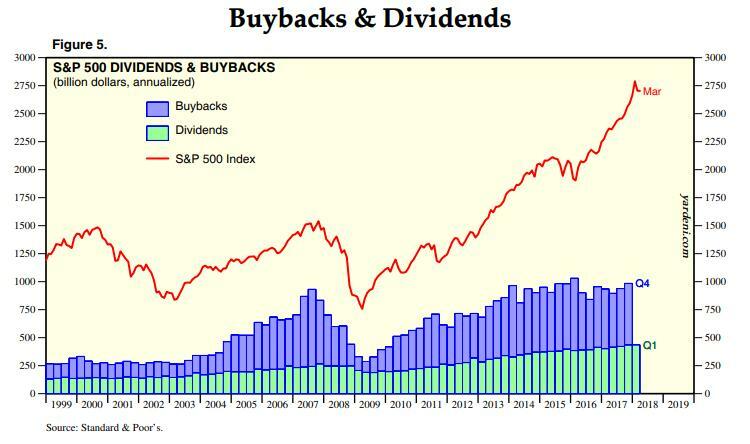 You are looking at the last 20 years of the S&P500 charted with buybacks and dividends. The buyback cycle goes something like this – Corporate boards buyback their own stock in proportion to the general cycle of bullish and bearish market sentiment. Corporate buy backs increase with a bull market and decrease with bear market. You will notice that buybacks in S&P 500 companies topped out in Q1 2016, And have pretty much stagnated since. They have stagnated at an extreme high mind you, so it’s not as if corporations have suddenly turned frugal with their cash! It is interesting though, valuations are so extreme now, that even corporations have stopped chasing this market! It looks like this is another indication of the change of trend to come. This willing buyer of stock, may well now turn into an active seller in the coming downtrend. Lets put this one in the ‘should have seen it coming’ bucket, along with everything else! Wave Structure: Topping in wave [B] black. Long term wave count: lower in wave [C] black. EURUSD is looking weak across the board, and I think it is time to seriously consider the bearish alternate count. On the daily chart, we see a clear bearish momentum divergence we could now be entering into a possible cyclical downswing in momentum. This is occurring off three year highs in overbought extremes! So I am sitting up and taking notice. The 4hr chart shows a possible complete five wave pattern at the high of 1.2556. The price has limped along since then with a series of lower highs. Is Recent Stock Market Rally Real Or A Blow-Off Top???????? Monday’s Market Magic Trick – Rising Without The Fed? Another Year Of Double-Digit Earnings Growth Ahead For S&P 500 Companies?